Caption: During my recent trip to Brazil, I visited the lab of neuroscientist Miguel Nicolelis to check out the device that he and his colleagues unveiled at the FIFA World Cup opening ceremony. 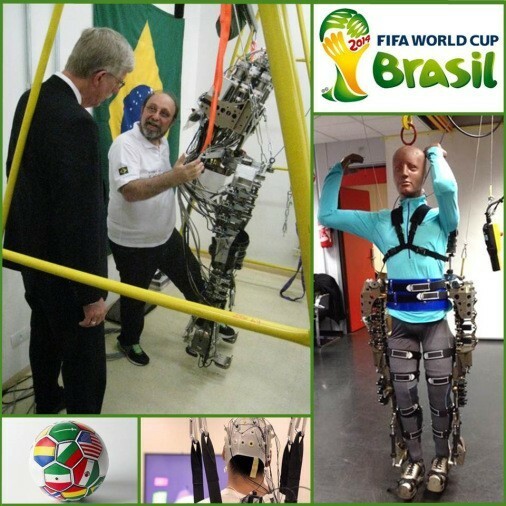 More than a billion people all around the globe got their first look at cutting edge neuroscience research in action today when a paraplegic youth wearing a thought-controlled, robotic exoskeleton kicked a ball to launch the 2014 FIFA World Cup&nbsp;opening ceremony in São Paulo, Brazil. While much work remains before this or similar devices become widely available to people with paralysis, today&rsquo;s moment does provide an inspiring glimpse of just one of the many things that can be achieved when science is supported over the long haul. In fact, the dramatic debut of this robotic exoskeleton was grounded in more than 20 years of scientific studies, including basic research supported by NIH and clinical research funded by the Brazilian government. The leader of the team, Miguel Nicolelis, a Brazilian who co-directs the Duke University Center for Neuroengineering in Durham, N.C., has been working on brain-machine interfaces in various animal models for decades . In a pioneering experiment involving a monkey equipped with brain sensors that sent real-time commands associated with leg movements, Nicolelis showed that the animal could spur a computer-controlled robot located thousands of miles away to walk by simply thinking about walking . Now, Nicolelis has shown that a similar feat is possible with humans, using a robotic exoskeleton system built in conjunction with German colleagues who are part of the non-profit Walk Again Project.